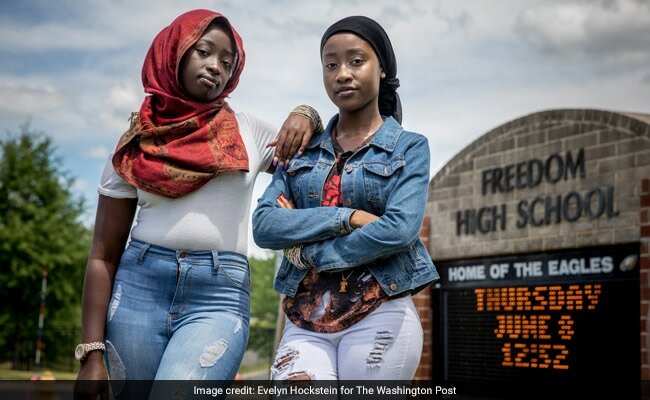 The administrators of a school in Northern Virginia allegedly threatened two Muslim students not to wear hijab at their graduation. The students described it as an embarrassing level of scrutiny. Fatmata Mansaray (right) and Hajah Bah outside Freedom High School in Woodbridge, Virginia. When Fatmata Mansaray and Hajah Bah cross the stage Saturday for their high school graduation, they plan to do so proudly wearing head scarves of black and gold tucked beneath their graduation caps. Those are the Freedom High colors. But last month their hijab drew sharp questions from administrators at the Northern Virginia school - in what the two observant Muslims described as an embarrassing level of scrutiny. School officials threatened them with discipline, the students said, demanding that they remove the scarves and pressing them to get permission slips from their parents to prove they were Muslim. The young women, both 18, said the principal suggested the scarves might simply be a cover for an unfinished hairdo. Mansaray said an assistant principal threatened to write her up for being disrespectful when she explained they were wearing hijab for a religious observance. 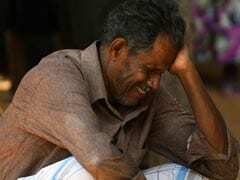 "I interjected, 'It's religious. We're fasting for Ramadan. You guys are constantly harassing us,'" Mansaray recalled. Mansaray's account of her discussions with administrators at the Prince William County school, which she shared on Twitter June 1, drew condemnation from civil rights activists and, ultimately, apologies from school officials. The school's handbook was amended to ensure principals know that students need not "prove" their religion to wear hijab. County schools Superintendent Steven Walts, along with Freedom High Principal Inez Bryant and Assistant Principal Christi Feemster, have personally apologized to the pair and their parents, the students said. Walts remained contrite at a school board meeting this week, when he reaffirmed that the district -- one of the state's most diverse -- welcomes all religions. "We have fixed this issue and we have made it crystal clear throughout our school division that if you are wearing something that has to do with your religious beliefs, we certainly accept that and honor you for your religious beliefs," Walts said Wednesday. The Council on American-Islamic Relations condemned how administrators treated the students, saying officials should receive training in religious freedom issues. Asking the women for permission slips "is a very ignorant request and also unconstitutional," said Debra Katz, a D.C.-based civil rights attorney. "The suggestion that somehow you have to prove the sincerity of your religious background or belief is completely inappropriate." After Mansaray's tweet, school officials sought to quickly rectify the policy that led Freedom High administrators to press the students for permission slips. Schools spokesman Phil Kavits said the district's code of behavior generally prohibits hats and other head coverings, except those worn for religious reasons. Freedom High's student handbook was worded differently. It said the exception was only for "documented" religious reasons. Kavits said officials revised the school's handbook to remove that word, and took steps to ensure principals countywide know that no student needs to "prove" their religion to wear a head covering. Feemster did not respond to a phone call seeking comment. Bryant referred questions about the incident to the district's communications staff, who said Walts spoke on behalf of the administrators. Like many women in her family, Mansaray said she wears a head scarf sporadically. But covers her head consistently during the Muslim holy month of Ramadan. Nearly every time she wore the scarf in the past school year, she said, administrators told her to remove it, sometimes questioning the purpose of the head covering. When she protested that she wore it for religious reasons, she said, they frequently told her she needed a note. In January, Mansaray said, Bryant approached her in front of the cafeteria and told her she needed permission to wear the head scarf. That occurred within earshot of her peers. "That's when I got a note, because I was just so embarrassed," Mansaray said. After her mother wrote a note, another assistant principal, Robert Schraml, then drafted a corroborating one that she was required to carry in case she was stopped. The letter read: "Fatmata Mansaray is authorized to wear a head wrap (hijab) in school as she is wearing it for religious reasons." Schraml did not return a phone call for comment. Bah said she began wearing the head scarf at the end of May in observance of Ramadan, which began May 26. Feemster approached her early in the week, Bah said, telling her she needed a note to wear the scarf. Feemster approached her again June 1 in an outdoor courtyard at the school, Bah said, threatening to send her home if she did not remove her head covering. At that point, Mansaray said she jumped in to defend Bah, explaining to the administrator that they were wearing hijab for Ramadan. The two students said Feemster summoned a security guard and sent them to the main office, where she threatened to write the pair up for being disrespectful. "I'm like, 'Why do I need a note for my religion?'" Bah said. "Why should you need to prove your religion?" Mansaray and Bah said Bryant, the principal, joined the meeting, explaining that she required the notes because some women wrapped their hair simply because they had not finished fixing it. "She said, 'Some of you women come into school with your head wrapped because you haven't finished taking your tracks out and your edges aren't laid,'" Mansaray recalled. Both were let go without being disciplined, but left the school in tears. Mansaray posted information about her encounters with administrators on Snapchat and Twitter. Classmates rallied around a hashtag on social media -- #justice4hijabis -- and organized a protest. One day last week, Mansaray said, about 40 non-Muslim classmates covered their heads in solidarity, including a couple of boys.